Gremi Church of Archangels and Royal Tower is part of the Tentative list of Georgia in order to qualify for inclusion in the World Heritage List. The city of Gremi was the capital of the kingdom of Kakheti in eastern Georgia for about 150 years, before its destruction by the army of Persian Shah Abbas in the XVIth century. It was then considered an important commercial, cutural and educational center. The oldest part of the town, on the top of a hill, is the well-preserved. For some reasons, its buildings have not been destroyed as the rest of the city. It consists of the Church of Archangels Michael and Gabriel, a three-stories royal palace with a bell tower and a wine cellar, all surrounded by a defensive wall. Coming from Tbilissi, those impressive structures are seen from far away. The Church is an active church, so dress modestly. Frescoes adorn the walls, and if lucky, some religious fonctions would be in session, with songs and prayers. The palace is erected beside the Church. Nowadays it hosts a small museum (with a small fee, closed on mondays), with a labyrinth of medieval rooms and corridors. The king’s bathroom seems to be a favourite room with the museum guards. At the bottom of the hill, some mere remains of the city can be seen. In the west lies the ruins of the commercial district, and in the north the royal ditrict. It is mostly walls to be seen, and offer not much interest. 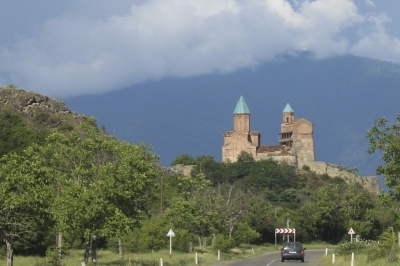 Gremi along with Alaverdi Cathedral is a nice day trip from Tbilissi. It can be combined with visit to wine cellars, and numerous guided tours are available.